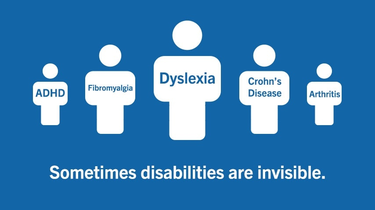 Post-traumatic stress disorder, chronic pain, brain injuries, mental health issues, autism, vision and hearing impairments, and cognitive dysfunctions are a few common “invisible” disabilities that may not be obvious to a casual observer. First of all, what are “invisible disabilities?” The Invisible Disabilities Association summarizes what you need to know. Many people with hidden disabilities do not feel comfortable revealing this to their employers out of fear of being stigmatized or passed over for promotions. This New York Times column paints a fuller picture of this predicament. The Americans with Disabilities Act (ADA) allows employees to request “reasonable accommodations” at work. Find out what this means and how to go about implementing policies that make everyone feel included. Compensation Connections has a bounty of resources of a variety of topics, ranging from disability employment law to recruiting new employees with disabilities.